Slitherlink puzzles are wonderfully pure logic puzzles with simple rules, yet can be surprisingly rich and complex to solve. They're also sometimes known as Takegaki puzzles, Loop the loop or Fences puzzles. To solve a Slitherlink puzzle you must draw one single loop by joining the dots with horizontal and vertical lines. The loop cannot touch or cross itself at any point. 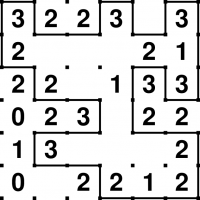 Wherever a number appears in the grid, there must be that many horizontal and vertical line segments adjacent to it (immediately left/right/up/down). Any line segments you draw in the grid must be part of the loop. The example solved Slitherlink puzzle on the left makes the rules clear. Notice how there is a single loop drawn, and how the loop travels past each clue the given number of times. For example, a '3' clue must have 3 of its side forming part of the loop, as in the top-left number in this example. Conversely, if a square has a '0' in it, as in the left column here, then there must be no parts of the loop neighbouring those clues. Not all parts of the puzzle grid have numbers in - it's up to you whether the loop passes by these areas or not, and how many times. It's not necessary to use all of the grid dots in the solution, as you can see in this example. Every Slitherlink puzzle only ever has one possible solution, and it can always be reached via reasonable logical deduction. Guessing can sometimes help if you get stuck, but usually there's a smart way to get to the solution too. Slitherlink puzzles on puzzlemix appear at a wide range of sizes and difficulties, typically from 10x10 upwards. Are you searching for help with Slitherlink puzzles? Stuck on solving Slitherlink? Don't know the instructions for Slitherlink? Need Slitherlink instructions? Want solving hints and tips for Slitherlink? Then puzzlemix is the place for you to play Slitherlink puzzles online. Looking for printed Slitherlink puzzles? Visit Sudoku Xtra for puzzle magazines and books. Or are you looking for a Slitherlink puzzle supplier? If so then check out Any Puzzle Media, my puzzle production company.